It’s that time of year where we will be looking for recipes for hot foods again – and heartwarming, flavorful soups and stews are on the top of my list of favorite comfort foods that not only satisfy, but don’t have to pack a lot of calories or fat. 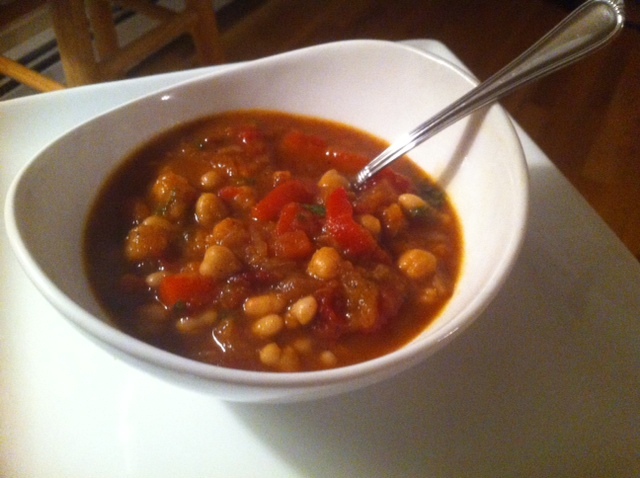 Since going vegan, I am trying to incorporate a lot of beans since they are great source of protein, and also amazingly tasty and versatile. I came across a recipe from the Wimpy Vegetarian blog that I absolutely loved but instead of adding eggplants (I’m a fan of eating according to the seasons, when the produce is at its best) I chose to include kabocha squash. Squash is a great source of healthy carbohydrates and there are a gazillion varieties out there for you to experiment with. Trust that I will be including many recipes for squash going forward!! As a newbie in the strictly tplant based food world, I must admit that I had no idea meatless and dairy free dishes could taste so unbelievably good. Rich, layered with flavors that range from sweet, salty, tangy to spicy – this stew will transform even the most resistant of carnivores… The clever use of spices, herbs and other condiments make this a recipe I will be making regularly this coming winter. Enjoy with no guilty conscience!! 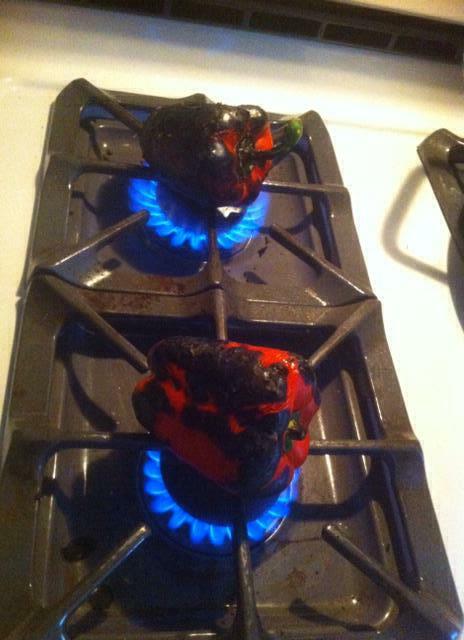 Place the blackened peppers in a bowl and cover tightly with plastic wrap and let sit for about 20 minutes or so. Peel the skins off and remove the core/seeds and chop into thin strips. Season with a bit of salt and olive oil and set aside. Heat two tablespoons olive oil in a large soup pot over medium-high heat until very hot. Add the chopped onion (it should sizzle when it hits the oil), season with some salt and sauté until lightly browned, about 10 minutes. Don’t move the onion around too much or it won’t brown. Add the garlic and cook another two minutes. Add the cumin, paprika and ras el hanout and sauté another minute to toast the spices. It should be very fragrant. Add the chipotle in adobo, cook another minute, and then add the red wine, water/broth, chopped tomatoes, vinegar, sugar, salt, lemon juice, and mint. Fold in the chopped roasted kabocha and red peppers. 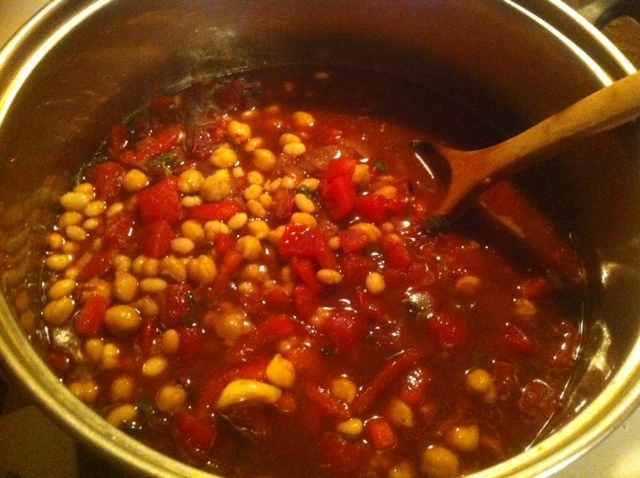 Add the chickpeas. Gently simmer for ten minutes to begin to meld the flavors. I enjoy your blogs and facebook entries very much! Love both your seriousness and sense of humor! Also, great recipes! Spinal stenosis is nothing to mess with. Very frustrating! Hi Sally! Sorry to reply to you so late, but it’s great to hear from you and that you are still checking in on my blog! I want to get better, I only need 24 hours more in the day! 🙂 Sorry to hear that you are still struggling… hang in there, it WILL get better!! Thanks again for your comment and for stopping by – wishing you happy holidays and talk to you soon!